This post was written by our 8 year old (and typed by her mom. Hunting and pecking 400 words would have taken a really long time!) It was her idea, and these are all of her own words. Happy Father’s Day, Tim! We love you. 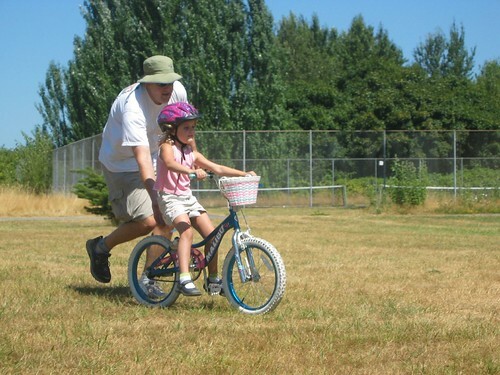 My Dad is the one who taught me to ride my bike without training wheels. In the summer, we used to go down to our spot at Magnuson, it was a steep grassy hill by the tennis courts. Dadddy drove me down there with my bike, it was usually only me and daddy. I would coast down the hill, try and steer and while I was steering, I tried to see if I could use my brakes while doing it. We would stay there all day. The only time I got hurt was when I was going down the part of the hill that I usually didn’t go down, I tried to steer, except my bike fell over. The back of my knee was out so I scraped the back of my knee.